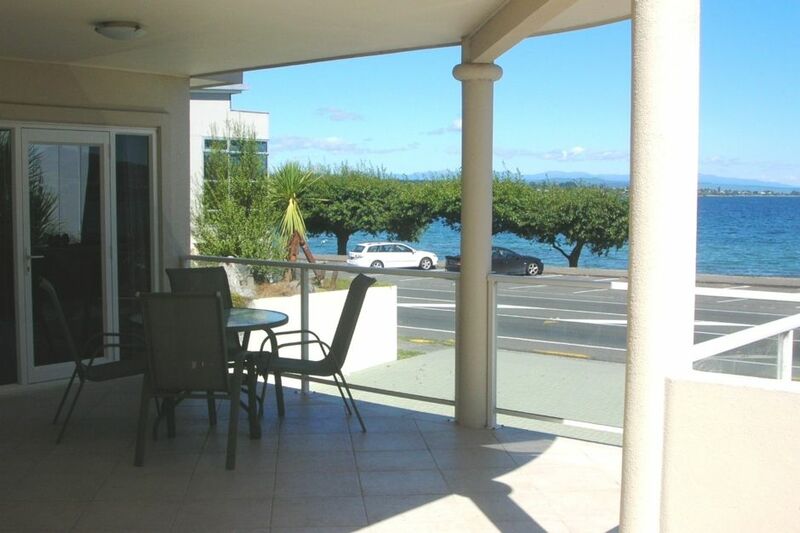 This modern, three bedroom, two bathroom apartment on Lake Terrace has stunning Lake and mountain views. The lounge faces the Lake and double doors lead out onto a good sized patio with outdoor furniture and a BBQ to sit and relax and watch the sun go down. The master bedroom has an en suite with spa bath and walk-in robe.The two additional bedrooms share access to the main bathroom.The lounge has a heat pump for year-round comfort and also WiFi, TV, with Chrome Cast and a DVD player. The garage can take two cars end-on-end and has internal access up the stairs to the lounge. Walk across the road to take a stroll along the Lakes edge and enjoy a coffee or walk into town for great restaurants and shopping. If golf is your thing then Taupo can offer 2 courses in town with the Wairakei International Golf course just 9km north of Taupo and the Kinloch Golf Club 21km to the west. For the keen trout fisherman the popular Waitahanui Stream is a 10 minute drive away or you can head down the Lake a little further to Turangi the "Trout Fishing Capital of the World". For ski enthusiasts take a drive to the Tongariro National Park where there are 3 skifields to choose from or in summer take on the challenge of the Tongariro Crossing, considered the best one day trekking New Zealand. *Linen not included, hire is available for $15.00 per person. Please ensure you let us know when you book if you require linen. We use a hire service to provide our guests high quality linen, please note that the beds will not be made up and you will have to complete this upon arrival. *Portacot and highchair are available for hire, for $25.00 each. Across the road from the lake. Great location, central and have all you need. Awesome location. Coffee cart and gelato just over the road. Ideal for our family with having the lake right there too. The location was fantastic and I would highly recommend it,however,in this day and age I find no wifi and no rubbish collection(we have to take our rubbish to the tip)a little rude. Thank you for your feedback. Since your stay we have added unlimited Wi-Fi and Rubbish collection at Alpine Vista to make our guests stay more enjoyable. We look forward to the opportunity to host you again!